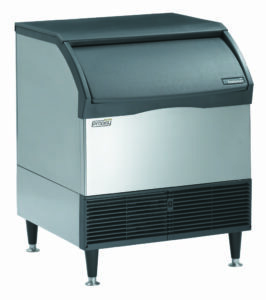 Under-Counter or Modular Ice Machine? 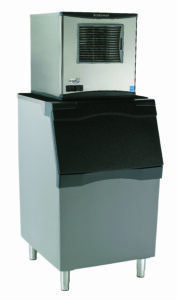 The question of whether to choose an under-counter style ice machine or a modular ice machine comes up quite often. Usually, this comes up for smaller operators that either don't have a lot of room for the equipment or the usage volume is not that high. Modular Ice System with Ice machine on top of the ice storage bin. The number one thing to remember is to actually get the machine that best matches your true regular ice needs and not the one that is just the easiest to install or that you have room for today. Better to rethink your work flow and do some rethinking of the work-space if needed. A little work in the beginning can save a lot of challenges later on down the line. The most common challenge is not enough ice. This is when someone goes for the under-counter unit when they should have gone for the modular style. 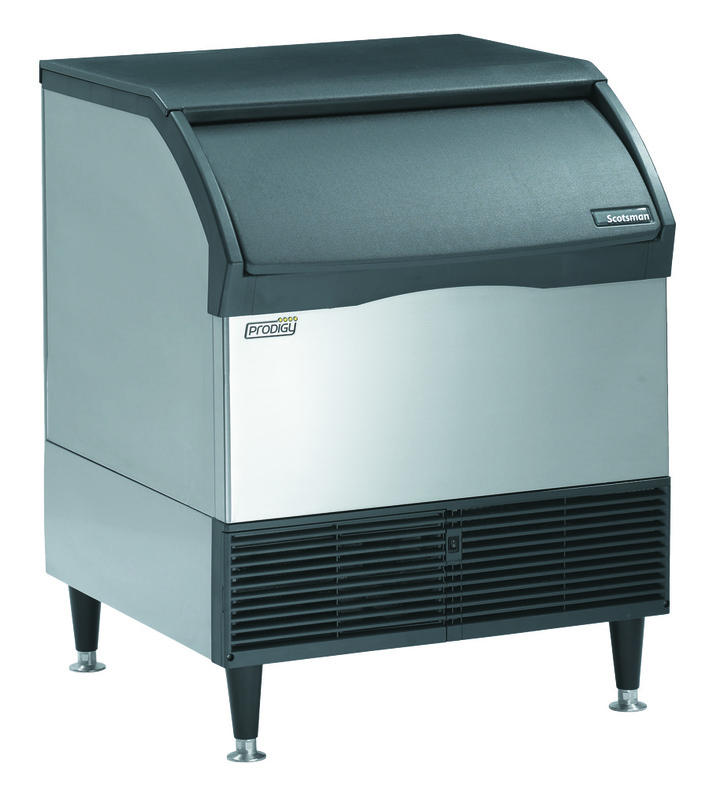 A less common challenge that comes up is that the machine is too big and the end-user only uses a minimal amount of ice from the storage bin. This can cause the ice stored in the bottom of the bin to fuse into large chunks and also we've seen residue/mold form at the bottom of the bin. Sometimes the bin drains clogs up as well. These are examples of issues that come up with modular style units that are too large for the application. Again, choose the unit that best suits your needs for most days of the year. Don't plan on buying a machine that will meet your needs for that once-a-year carnival/party as you will end up with a machine that is too big for your everyday needs. Also, don't buy a machine that you know is marginal and will not meet your projected growth as you can be sure that after many days of an empty ice bin, you will end up going through the entire process of choosing an ice machine again! Something of note is that Ajax provides an upgrade option within the Full Service Ice Machine Leasing program. Meaning, you can start with a small machine to meet your current needs and then upgrade to a larger machine once your business grows! Whether you go with a trusty under-counter model or a larger modular system they both require a dedicated power source that meets the amperage and voltage requirements, a reliable drain system, (usually a floor sink) and a water supply with shut-off valve and adequate water pressure. See previous Ajax blog post for more on installation requirements! Feel free to call Ajax for help in deciding what you need! Most times, if you are in our service area, we are available for a site survey to hep in your decision making process. Ajax offers great options when it comes to purchasing ice equipment! Ajax's Full Service Leasing program is a great way to go as well, let us take the work off your hands and make owning an ice machine EASY! Currently Ajax services are available from the Santa Ynez Valley to Thousand Oaks and inland to Simi-Valley as well!